I don't know why I sat on this one for so long after receiving a copy for review. I was so excited about the early buzz and then, when I actually had it in my hands, I think I fell prey to the hypemonster and let my worry that it wouldn't live up to expectations get the better of me. Wasn't the first time, won't be the last. More's the pity. Fortunately, that lingering suspicion that it might, in fact, be just lovely stuck around. And the other night I paused my regularly scheduled programming of historicals for this debut contemporary from Jasmine Guillory. As you can probably guess, I have exactly zero regrets. Alexa Monroe is excellent at what she does. As the mayor of Berkeley's chief of staff, her latest project is getting her boss on board for a youth arts rehabilitation program. And while she doesn't so much have a life outside of her job, she does have a handful of close friends and an older sister she admires, even if she never sees her. Then one evening, Alexa gets stuck in an elevator with Drew Nichols, a pediatrician who is in town reluctantly attending the wedding of his former girlfriend to one of his best friends. Drew is in dire need of a date and, over a handful of cheese and crackers, somehow talks Alexa into filling the role. When he accidentally refers to her as his girlfriend in a conversation with the groom, the two virtual strangers are forced to up the ante on their ruse. The results are surprisingly successful. So successful, in fact, that Drew delays his flight back to L.A. to spend the next day with Alexa. What follows is a series of flights between Oakland and L.A. as Alexa and Drew can't seem to let go of this thing between them. Their respective friends have their qualms, namely Drew's inability to maintain anything resembling an actual relationship and Alexa's inability to come out and say how she's feeling. There's also the fact that Alexa is black and Drew is whiter than white. But when they're together, none of that seems to matter. Until, of course, it does. Hey," was all he said. She looked up and smiled at him, just the way he'd wanted her to. He smiled back, so happy to see her that he had to take a step back. The meet cute in this irresistible novel is pretty freaking cute. But it's what comes after that really steals your heart. The helpless happiness that both Alexa and Drew experience whenever they're together is absolutely tangible. And the way that Ms. Guillory manages to capture and bottle that happiness carries the reader along with these two quite disparate individuals on a wave of stomach-fluttering hope and longing. My favorite part of Alexa and Drew's story is how they felt like people I know and work with and pass on the street. What I'm trying to say is, their days and their nights, their lives and their love―it felt plausible to me. Every once of it. I felt grounded in their arc and just how extremely satisfying it was to stick with them. Both of them have their flaws and hangups, particularly Drew (there, I said it). All of these felt organic to me, too, and not as though they were being amplified out of proportion for dramatic effect. I liked how the narrative refused to shy away from the flaws, how directly Alexa faced and voiced their inherent differences in race and culture, and how Drew wasn't perfect in his responses at first (or second), but how he accepted her read on them and adjusted his perspective and words and actions accordingly. And expected those around him to do the same. The result was that I felt empathy and respect and patience both for and with them. There are no epic misunderstandings in this novel (praise be), though there are (happily) a few incredibly romantic gestures. But what really makes up the bulk of The Wedding Date are real conversations, real emotions and feelings being risked and hurt, genuine fears being silently held, a raft of swoonworthy quiet moments, and copious amounts of delicious food being eaten cozily on each other's couches. Truly, this book will make you want tacos something fierce. And crackers and cheese. And pizza. And doughnuts with sprinkles (and I don't even really like doughnuts). But they represented happiness here. And so I wanted them, and I wanted them for Alexa and Drew. Two smart people who found each other and didn't want to let go. 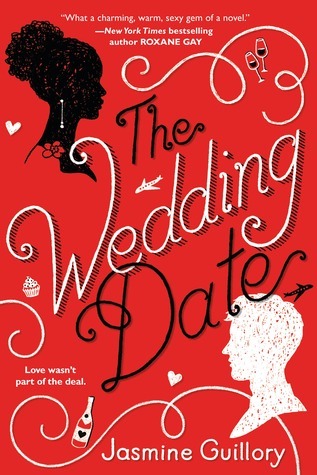 I just loved The Wedding Date, and I can't wait to read more from Jasmine Guillory. Lucky for us, Drew's best friend Carlos's story is due out in September.